A beach in the middle of the city - The idea is not brand new but still good! How did that happen? Admittedly, the idea of a city beach called "Wellenbad" in the immediate vicinity of the Löwenbrücke is not new. Because the Würzburger wave pool was there before: above said bridge could splash around 1900 opposite the main island in "Hügels-Bad". The official municipal swimming pool was at the same time a military swimming school and served for the physical training of the soldiers stationed in Würzburg. In the city there were other forerunners of the Dallenbergbad. 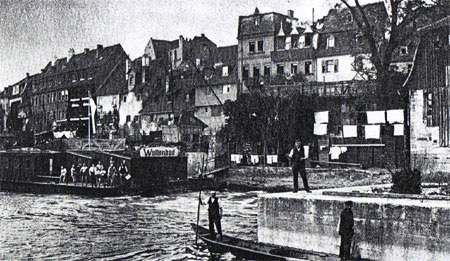 The most well-known: Braun's men's and ladies' bath opposite the hotel "Zum Schwanen" (later Brod's ladies bath), down the river "Scheuer's Wellenbad" and a little further on the bathhouse of "Brod & Mehling" near the Friedensbrücke. Even though the sea of rubble has given way to a vibrant city, relaxing is still required today. With us you can take a small (or larger!) Time out: during the lunch break, between two lectures or "after work" until late in the evening. Welcome us, enjoy the beautiful weather, stretch your feet in the sand and relax as if on vacation. No traffic jams, no bleak hotel castles - and, above all, almost at your doorstep! Especially shortly after the war, a large part of urban life took place on the Main. The Würzburgers fled here from the sea of rubble to relax after their daily work of reconstruction.